I will be the first to admit that my skill at as a gaming programmer about the level needed to write a game of “Pong” or perhaps “Yar’s Revenge” on a good day. To develop a game such as Survivalcraft is beyond my scoop. Kaalus, the developer of the game has done a wonderful job working in animals to the game and in general the AI (artificial intelligence) is very good. However, sometimes the logic used to the games characters does strange things. 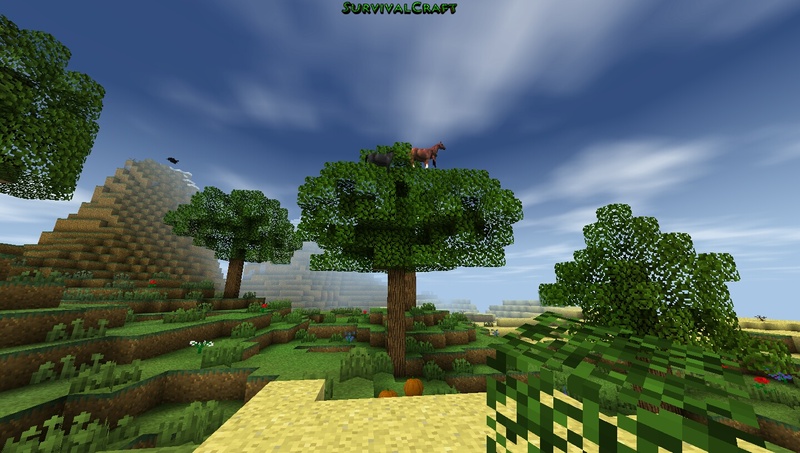 In this case a horse is able to stand on top of a tree (see picture above). To the program, everything makes sense. To it there is no reason why a horse cannot climb to the top of this tree. This is the challenge/danger in AI programming – how do you take a reality (real or artificial) and create every logical rule to explain that detail? I love new technology, but it may be awhile before I trust a computer to drive a car….or have my atoms scrambled and then rearranged somewhere else….